Kauai — end of the road. That way lies Japan. I’m not a patient traveler. Hours before my flight would leave Lihue, I was packed and out the door. The shuttle driver was friendly. I asked if he had lived on Kauai all his life. He said he was born on Oahu but moved to Kauai in 1974. His family, which is huge, camps at Anahola Beach for a month every summer. Beach camping is restricted to three days, but the aunties and uncles and brothers and sisters line up and reserve a spot for successive three-day stays. He talked joyfully about their time together. He said his kids, age three and five, adored the beach. Hawaiian families are close. 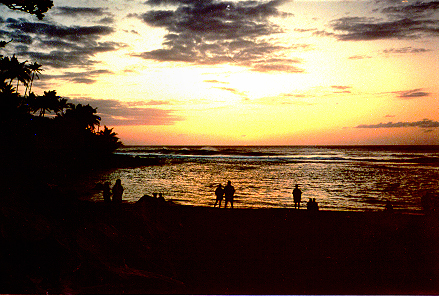 TV stations on Kauai feature endless children’s events, filmed in the manner of home movies – keiki (kids’) surf contests, hula performances, beach gatherings of civic groups with children prominently featured. A clerk at Hawaiian Airlines said I could take an earlier flight to Honolulu, and I gratefully accepted, feeling I’d rather spend the time there than in Lihue. Arriving in Honolulu, I checked my bag and asked about shuttles to Waikiki. I wanted to buy a handmade t-shirt for a friend before leaving Hawaii and figured there might be decent crafts downtown. A sky cap said I could take the airport shuttle for $7 or the city bus for a dollar. I chose the city bus in honor of my mother, a spunky traveler who would always explore new cities on metro transit, often making friends with women her age and being invited into their homes. I caught the wrong bus, realizing my mistake when we passed the Pearl Harbor Memorial, and scrambled across the highway just in time to catch a bus going the other way. The ride to Waikiki was ten miles of dilapidated wartime housing. Downtown Honolulu was scarcely more inspiring: generic skyscrapers, with views down cross-streets toward lovely green hills beyond. I sat in the back of the bus, vibrating with the motor, an unshaven geezer on my left, a Japanese boy and girl ahead. They looked about twenty-one. The boy closed his eyes and sat straight-spined, meditating until the girl signaled their stop. No one paid him the slightest attention. I breathed deeply and slowly to calm my mind, which tends to get jumpy on buses. It takes me a long time to get inwardly quiet and focused. Yoga breathing helps, but it’s only as good as the raw materials. The bus wound through an awkward tangle of downtown streets, turning when I wasn’t expecting, and finally reaching the harbor at Waikiki. I got off and wandered through a mall in search of wonderful Hawaiian crafts. No joy. Shoulders aching from a backpack laden with fruit and my laptop, I felt disappointed and far from centered. I located the bus stop and sat down gratefully to continue Kriya Yoga breathing. Soon I was feeling truly quiet inside. I strolled back to the shopping center without finding a gift, but enjoying the shops with relaxed mental focus. The clerks I spoke with were more guarded than on Kauai. On the bus back to the airport I renewed a lesson I’ve learned a thousand times: when you’re looking for peace, start with the body, then move to the heart, while involving the mind minimally. The return route was no less ugly. As we inched through downtown, throngs of office workers climbed aboard. I did Kriya, praying with eyes open while I people-watched. Tunnels Lagoon, recognizable as “Bali Hai” in the 1958 movie “South Pacific.” I spent many happy hours here snorkeling and listening to slack key guitar. At the airport, the agriculture guys wanted to take away my fruit, so I sat outside and ate a couple of bananas and an apple and gave the rest to a porter who didn’t thank me. 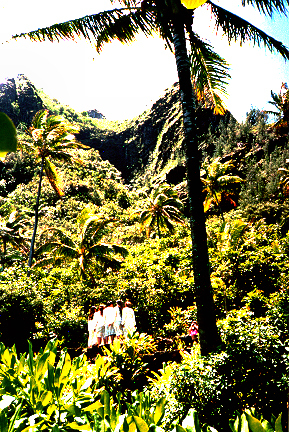 The Hula Heiau, Hawaii’s most sacred spiritual shrine. Someday I’ll reveal how I embarrassed myself here hilariously — a memory that makes me grateful for reincarnation. Passing the time in a gift shop, I talked with a Hawaiian sales clerk. He said he’d “been through the Sixties and Seventies” and complained that mandatory sentencing for marijuana users was putting growers and sellers in jail while murderers and rapists were released to make room. When an elderly tourist couple asked a question he helped them with sweet aloha. He told me the best place to wait for a flight was in the airport garden. He said a big white bird had built its nest there, and that he’d often seen it fly in to settle in for the night. I toddled downstairs to the garden. It was lovely, very large and darkly lit with Polynesian lanterns, fully two acres wandering in an arc between the airport office buildings. The middle section was a tropical rainforest, with small Japanese formal gardens at the ends. I sat on a bench in one of the Japanese gardens, watching a large brown shorebird stalk the banks morosely, looking like an elderly billionaire who’d just lost his young wife who’d cleaned him out before leaving. It eyed the giant carp greedily, seeming conflicted by their size. Sitting in the balmy Honolulu darkness, my thoughts lingered on the bus ride. I hadn’t reached that blissful state only by prayer; it had taken lots of breathing. Basic yoga: calm the body to calm the mind. Calm the mind to find the portal to blissful silence. 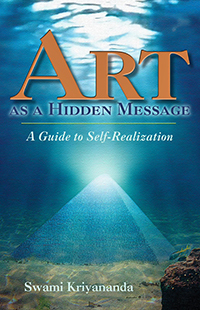 I had practiced Kriya Yoga to calm my mind in the noisy, crowded bus, and had ended up feeling wonderfully grateful and filled with love – no great effort was involved, just a relentless insistence that brought a gushing spring of inner communion with God that radiated to others naturally. I’ve never feel inspired in places where I’m supposed to. After Swami Kriyananda returned from Europe he spoke glowingly of the cathedral at Chartres. I, of course, felt nothing there, but I was profoundly inspired at Notre Dame and Sacre Coeur de Montmartre. 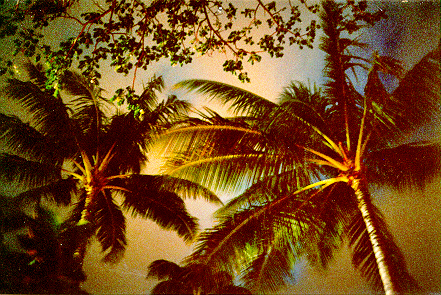 Palms at night, Honolulu International Airport. I can’t feel God’s love until I gear down. I ripped my body with methamphetamine more than fifty years ago, and the ravages linger. Two spinal surgeries after three years of paralysis from the chest down didn’t help. The yogis say it can take incarnations to get over the effects of serious drug abuse. Yoga breathing helps tremendously. Nothing is as centering as Kriya. I don’t much mind if it takes me a while to settle my head and get centered. The rewards far outweigh the effort. I went looking for a gift for a friend and found riches I couldn’t put a price on. The gardens at the airport are more than token green patches, thrown together because “We think it might be a good idea to soften this concrete monstrosity, but let’s not go overboard.” They’re the real deal, masterfully designed to create a restful mood for the traveler. I found it puzzling that only two other people were enjoying the gardens while hundreds walked overhead. A handful of airport workers stood on the outskirts, smoking quietly and drinking coffee. A young Japanese man sat nearby, his head bowed, energetically pecking with chopsticks at a carton of rice. I entered a dark, jungly area where I found a bench and lay on my back and did spinal stretches. As I unrolled and lay resting under the dark sky, the white bird feathered softly down through the trees and dropped out of sight in a thicket. I snapped pictures of the palms overhead. Patience and guidance to help them fly…. Each child through knowledge will shine one day. In every child there lies a promise. There’s great potential in their hearts and minds. Patience and guidance they will fly. Let’s show them we believe. Each one is very special. Let them live their dream. Not the sort of music you’re likely to hear at LAX, SFO, or JFK! On Kauai, the locals often asked if I lived there. When I mentioned this to my landlady, Judy Roth, she laughed. 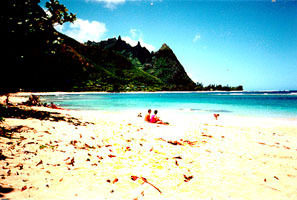 “Yeah, you look like a typical laid-back Hanalei type.” I wondered if the days I’d spent on the beach, drifting in the heartful strains of Keola Beamer’s slack-key guitar, had changed my vibe, or if my aura had shifted while I cruised face-down in Tunnels Lagoon, soaking in Hawaii until my fingers puckered. At any rate, Kauai was healing, but strangely, Honolulu was bliss. Nayaswami Rambhakta lives in the Mountain View, California Ananda Community. He is the author of The Joyful Athlete: The Wisdom of the Heart in Exercise & Sports Training and co-author/editor of Head & Heart: How a Balanced Education Nurtures Children Who Excel in School & Life. Kriya Yoga is offered as an initiation – for details, follow the link to the Ananda Kriya Yoga page. Excellent account! We’ll be on the Big Island tomorrow.